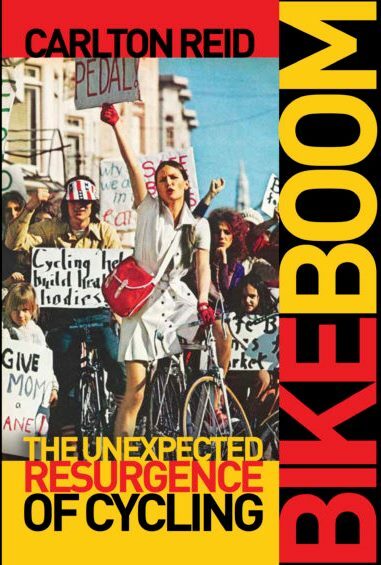 REVIEW: “Bike Boom: The unexpected resurgence of cycling” by Carlton Reid. 2017 “Copenhagenize: The definitive guide to global bicycle urbanism” by Mikael Colville-Andersen. 2018. First of all, an unequivocal endorsement of both these books from Island Press: They are essential reading for anybody concerned with the development of cycling as everyday transport for ordinary city dwellers – in fact anybody concerned with transport, public health, sustainability and urban life generally. And I am not someone who hands out plaudits freely!They also complement each other. Colville-Andersen pays his dues to Reid; “…reading a book like Bike Boom is absolutely the best way to get into the subject of the rise of the bicycle in history” (p.28). This relationship is worth looking at in more detail. This sentiment is generally attributed to Antonio Gramsci. With these books you get the more detailed and sceptical analysis from Reid; with Colville-Andersen you get, well, the fun. Let’s take Reid’s book first: Is this another book telling us that we are witnessing a “boom” in cycling which will take us to the promised land of a high cycling modal share and a sustainable transport system? The cover would appear to suggest this: but appearances are deceptive. Reid shows how the woman in the centre of the front cover (see above) was a fashion model planted on to demonstration. And the demo – in the middle of a short “bicycle boom” which was over two years later – didn’t succeed in its aim of installing cycle lanes on a San Francisco street. This then, is “not a rose-tinted promotion of the joyful practicality of cycling; it is a work of history, unafraid to reveal some inconvenient truths”. Reid questions whether “bike booms” have really existed or not (generally they haven’t for “quite some time”), and the conventional wisdom of what is required to achieve them (infrastructure is likely to be necessary, but a lot more is required). Based on the highest quality historical research, this excellent work provides evidence for what may be needed for a genuine shift towards to cycling becoming a significant part of everyday transport in the UK. I’m a long time sympathiser with the kind of caution exercised by Carlton Reid. My view is that we need a thorough examination of car culture, looking at issues such as the costs of motoring, traffic law enforcement and generally confronting unspoken ideas about transport which (some) “it’s just the infrastructure” cycling advocates miss out on. I’m interested in what happens where the highway environment isn’t engineered to eliminate danger to cyclists (particularly outside cities); and what lies behind the unwillingness to do such engineering in the first place. Colville-Anderson says “The global bicycle boom has been underway since 2007 and shows no signs of waning” – but in London and elsewhere that “boom” is minimal with plenty of doubts about the commitment from the powers that be to create or support it. This book is absolutely packed full of his and others’ photographs and other images with more of a coffee table format than other books I’ve reviewed. But don’t mistake that for it being lightweight. Serious (and contentious) argument abounds on every page. Did you, to take one of numerous examples, ever question white bike or “die-in” protests? I’ve always had some question marks, despite respecting the good intentions of the organisers, and so does Colville-Andersen (see page 254). He’s good on helmets, cargo bikes, the origin of the term “jaywalking”, “the concept of big”, “climaphobia” – you name it. “Design our cities for bicycles as transport and allow the majority to dress for their destination, not their journey”: there’s another quote. He’s fascinating on the failure to market environmentalism (“…the greatest marketing flop in the history of homo sapiens”): I have some disagreements there as I think that this is a question of political struggle rather than “marketing”. But that doesn’t matter: what matters is that he makes you think. 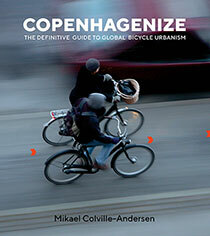 But above all, for this somewhat cynical and jaded transport professional, academic researcher and campaigner of many years standing, “Copenhagenize” is a book that puts a great big smile on your face. This entry was posted in Cycling on May 5, 2018 by rdrf.